Neuroprocesses While On A Rollercoaster | What's On Your Mind? Instructions: Working in groups of 3 or 4, choose a common activity in which each of you have participated or do participate (or with which you are at least familiar). For example, maybe everyone in your group enjoys dancing, watching television, or even working on a group project for a class. In any case, once you have your activity identified, go down the list and explain how each of the following parts of the brain would be involved, either directly or indirectly, in helping you perform or carry out that activity. Be detailed and specific in your explanations (i.e., use those “deeper processing” skills you just learned about). When you are finished, one person from the group must e-mail a copy of this completed activity for me to post to our wiki. The activity being analyzed is the experience of riding a very fast, high rollercoaster. Now, identify how each of the following areas, parts, and/or processes of the brain are involved. Medulla – While riding, the medulla is controlling the essential body functions such as breathing, maintaining a heartbeat, and a steady blood pressure. These are essential to living and thus are essential for a person to ride a rollercoaster. Pons – During the ride, the pons is functioning as a bridge that relays motor commands from the cerebellum to the brain. Reticular formation – The reticular formation regulates the body’s level of arousal by activating either the sympathetic nervous system or the parasympathetic nervous system. Since the rollercoaster ride is a stimulant, the reticular formation would be activating the sympathetic nervous system and exciting the body. Cerebellum – The cerebellum coordinates movements and is responsible for balance and motor learning. 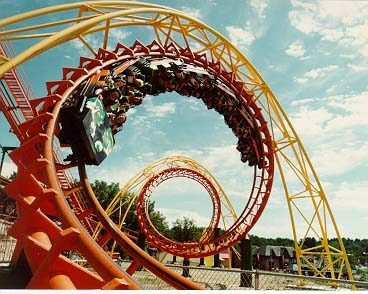 As the rollercoaster twists and turns sharps during the ride, the cerebellum is coordinating body motion in an attempt to counteract the jolting of the rollercoaster and keep the body balanced. Thalamus – The Thalamus can be compared to a train station. It is relaying all sorts of neural messages from different parts of the body and routing the signals to the appropriate areas of the brain for processing. All our sensory information except olfactory is routed through the thalamus. Basal ganglia – The Basal ganglia, similarly to the cerebellum, is coordinating the initiation and execution of movement. On the rollercoaster, the basal ganglia could be sending signals that cause the rider to grip the rollercoaster’s seat or handle bars in order to keep the body as still as possible. Hypothalamus – The hypothalamus is working to regulate the body’s internal environment through controlling the endocrine glandular system. On a rollercoaster, the hypothalamus would regulate the sympathetic and parasympathetic nervous systems which prevent the body from being overexcited which could lead to someone throwing up or fainting. Hippocampus – The hippocampus is linked strongly to memory creation and consolidation. During the ride, the hippocampus would be taking in the new memories, associating the memories with feelings at the time, and storing them so they can be converted to long term memories. Amygdala – The amygdale is involved in creating emotions such as fear, anger, anxiety, and aggression. The certain high or scary parts of the rollercoaster ride would most likely cause a feeling of fear and this feeling would be processed by the amygdala. Corpus collosum – The corpus collosum is the area that connects the two brain hemispheres and allowing a dynamic interplay of the two hemispheres. The two hemispheres are consistently transferring information between each other. On a rollercoaster, the interplay of the hemispheres would allow for a full visual experience. Motor cortex – The motor cortex converts neural messages from the cerebellum and basal ganglia into motor signals or motor commands that move the body to perform action. Any movement made on the rollercoaster, from gripping the seat to waving at friends, is performed because o signals sent from the motor cortex. Sensory cortex – The sensory cortex processes sensations that are sent from the whole body to the brain through the peripheral nervous system. These sensations provide the brain with information about temperature, pressure, limb position, and pain. A person on a rollercoaster would feel the rush of the wind or the cold of the metal rollercoaster. Visual cortex – The visual cortex is processing all the incoming visual signals. On a rollercoaster, its function would also be to measure height, speed, and environmental factors. Auditory cortex – The auditory cortex processes incoming auditory signals. This is what would allow you to hear the grinding of the metal wheels on the rollercoaster track or the scream of the girl sitting next to you. Prefrontal cortex – The prefrontal cortex is involved in abstract decision making. It would analyze the situation and perhaps present mental arguments to either support the rollercoaster ride or to encourage going on the ride. Broca’s area – Broca’s is an area on the left hemisphere of the brain that enables fluency of speech and word formation. This is the area of the brain that allows you to scream like a little girl as you speed down the rollercoaster. Wernicke’s area – Wernicke’s area is another area on the left hemisphere of the brain that allows you to comprehend speech and communication. This is what you used to understand the attendant at the rollercoaster who asked you for your ticket. Neurotransmitters – Neurotransmitters are chemicals released by axon terminals in neurons and they are how neurons communicate with each other. Different neurotransmitters are processed differently in the brain and result in a variation of feelings. The stimulation from the rollercoaster ride would most likely stimulate the release of dopamine for enjoyment and physical movement as well as other neurotransmitters that would either stimulate or calm other body systems. Somatic nervous system – The somatic nervous system would be carrying messages from nerve pathways throughout the body and relaying them to the central nervous system. Autonomic nervous system – The autonomic nervous system is regulating the body’s essential functions as well as the body’s state of arousal by activating either the sympathetic nervous system or the parasympathetic nervous system.